Wet process is the main treatment for any types of garments washing. Wet process can be done by using different types of chemicals. Wet process section maintains a process flow chart, which facilitate the whole garments washing processes and make easy to achieve desired garments shade. It is the first process of wet process section in garments washing. Here, de-sizing process is done by using de-size chemical to remove size material from the garments. To match with the desired shade, here enzyme process is done by using Acid or Neutral enzyme. Enzyme process can be medium enzyme, light enzyme, heavy enzyme or stone enzyme. 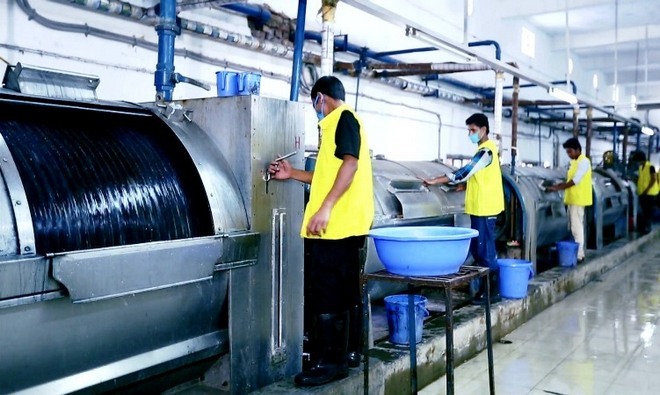 After completing enzyme process, garments are cleaned here by rinsing 2-3times. Here, color can be removed uniformly from the garments and removal of color is done according to the buyer approved shade. Bleaching can be done by using K.C.I bleach or Japanese Bleach. Bleaching chemical must be neutralize here by using Sodium meta-bi-sulphite or sodium hypo. After completing all the above processes, garments are unloaded from the machine and extracted by using hydro extractor machine. Garments are dried here by using gas dryer or steam dryer. Types of dryer selection depends on the desired shade. Here, it should be noted that, gas dryer is perfect for reddish shade and steam drys is for bluish shade. After drying, all the garments should be sent to the dry process section for P.P spray. Here, P.P sprayed garments are neutralized by using sodium meta bi-sulphite. Tinting is normally used for increasing the attractiveness of garments. Sometimes tinting is needed for matching with the desired shade. This process is done for increasing softness effect of garments. Softening can be done by using cationic or non ionic softener. Finally garments are unloaded from the machine and extracting by using hydro extractor. Here, garments are dried by using gas or steam dryer.